I'm on a roll this week. Wednesday's post had my latest top, a jelly roll race, and today I have 2 more made by Theresa and quilted by me. 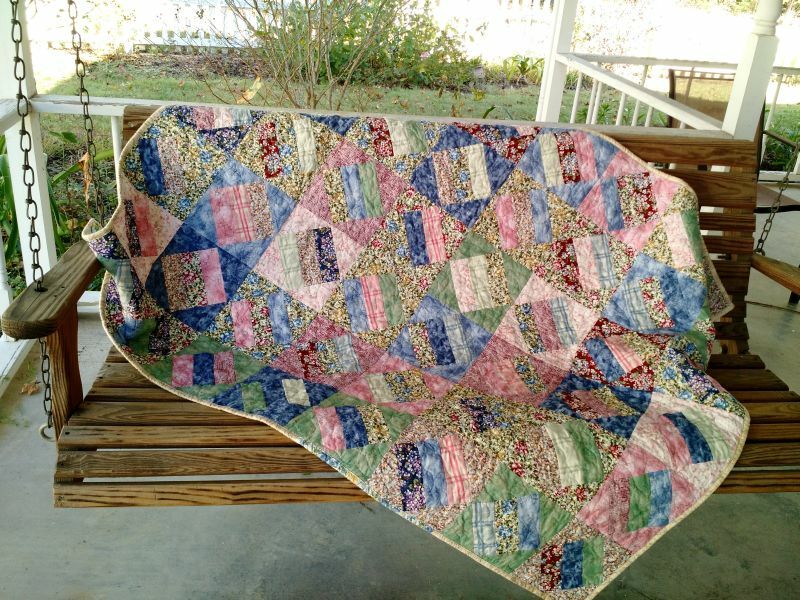 The first is this very pretty blue quilt with floral fabrics. 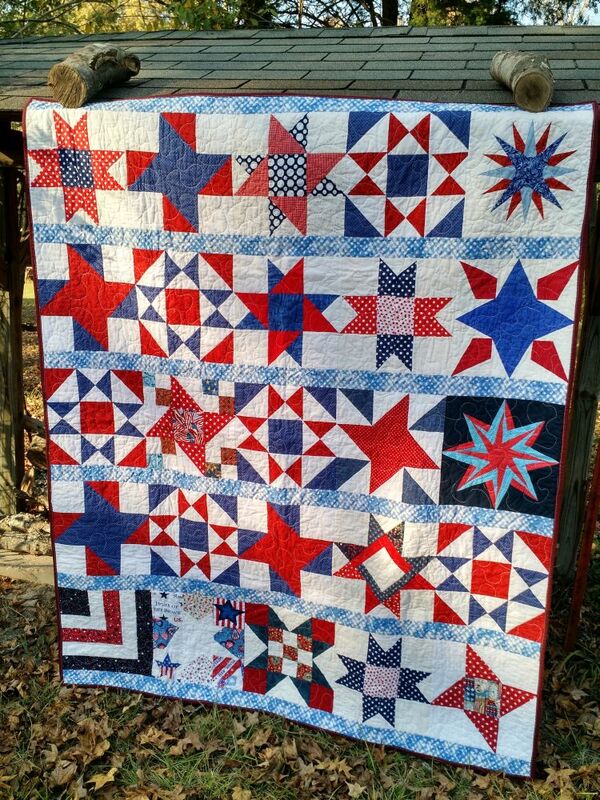 The second reminds me of picnics in summertime with its bright colors and daisies. 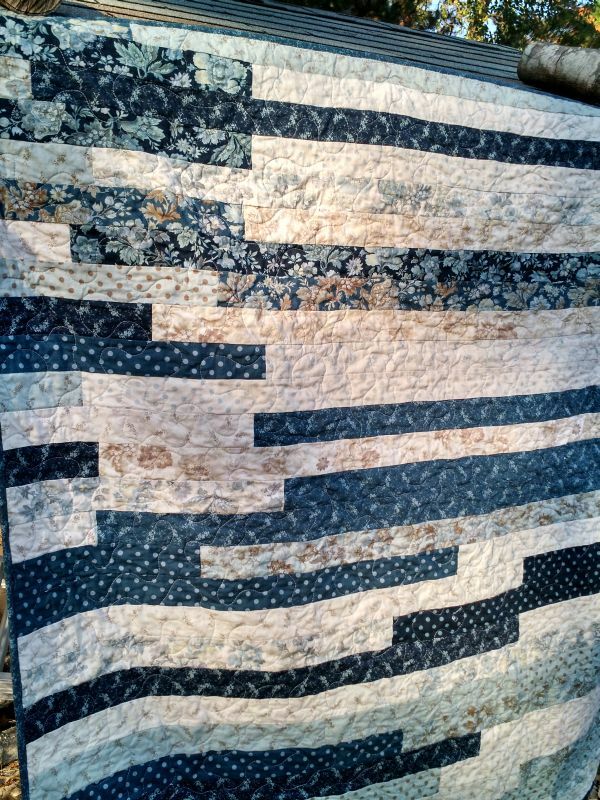 I quilted both with a stipple and they crinkled up nicely after a wash. These are quilts number five and six from the box Theresa sent me for Covered in Love! 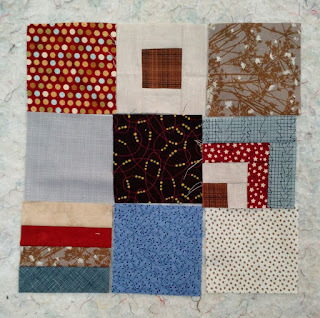 Meantime, work continues on assembling and quilting the blocks from the last block drive. Rory has been quality testing the early finishes. 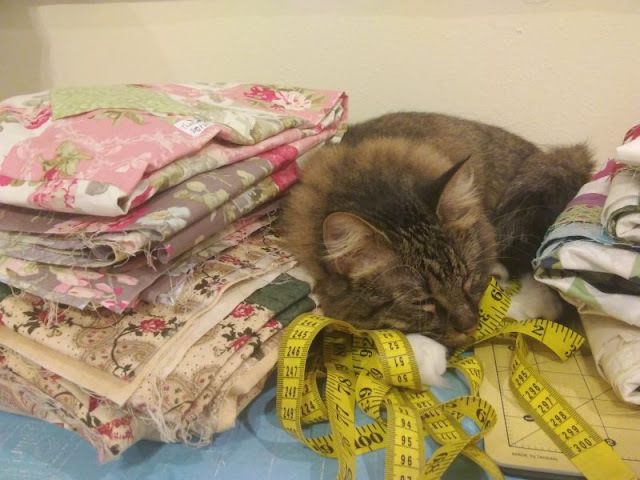 Sometimes you discover pretty fabric in your stash and just have to drop everything and sew it up. 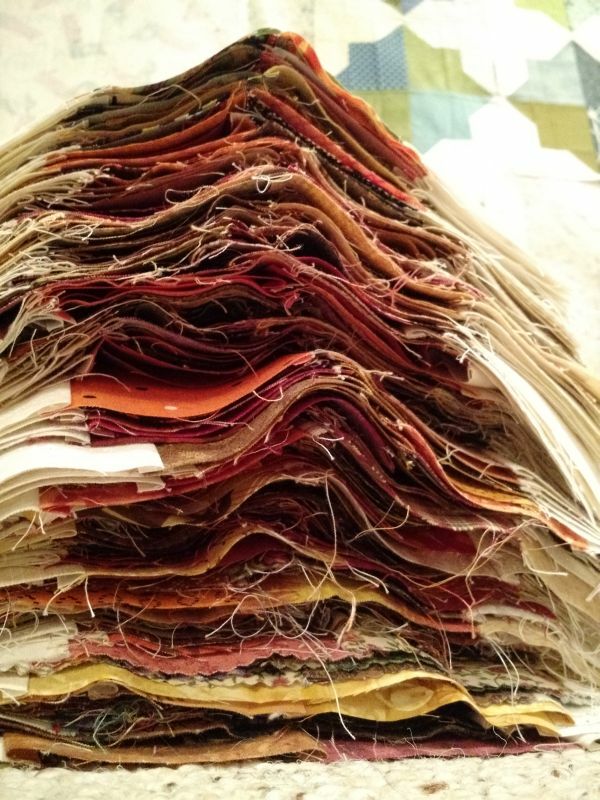 That's what happened when I rediscovered these Northcott Stonehenge 2.5" strips one of you donated. 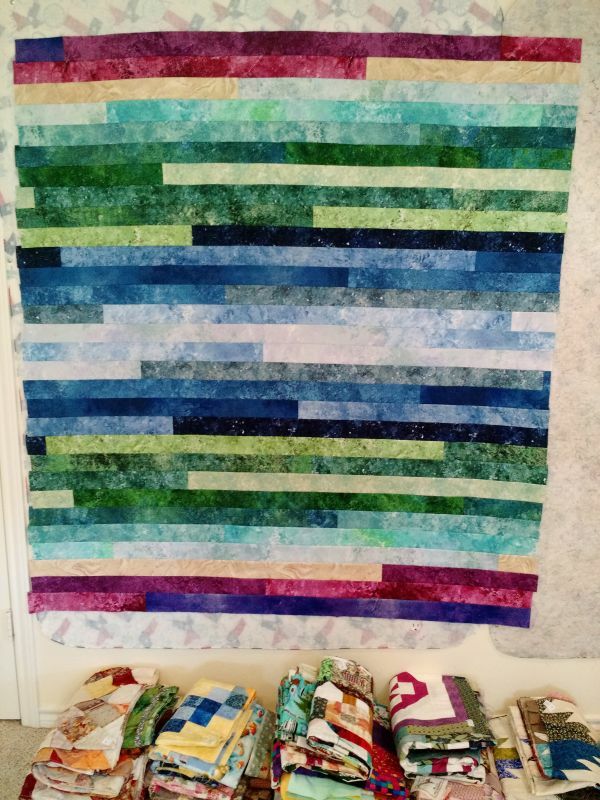 I went simple with a jelly roll race design. 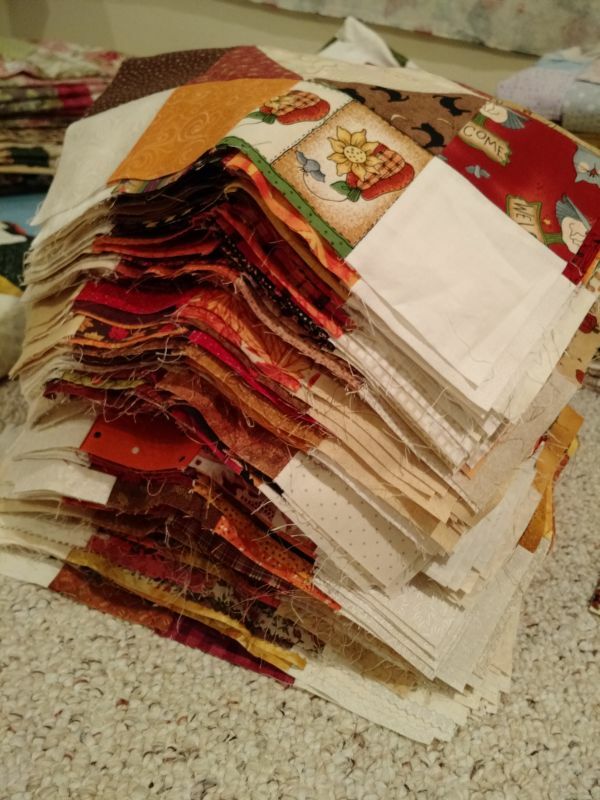 The strips looked so pretty laid out in the package, I just kept them in the same order to sew them together. 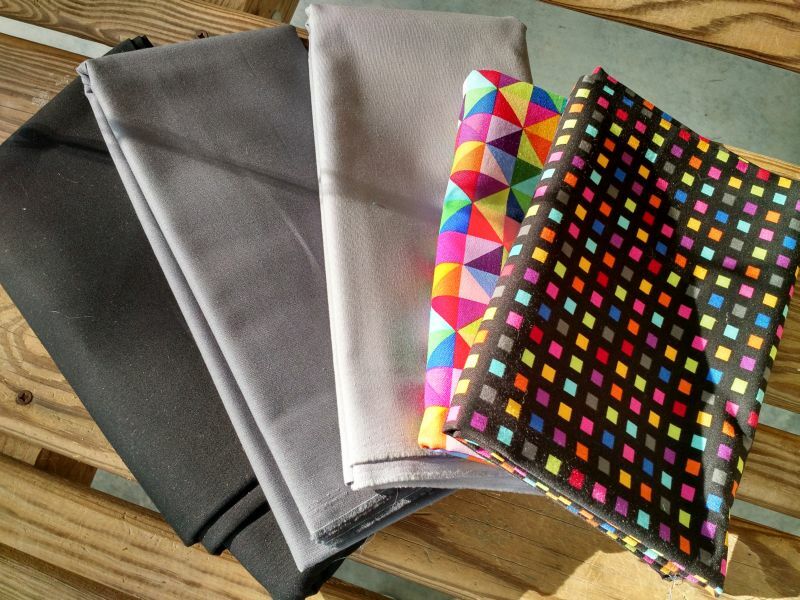 Speaking of Northcott Fabrics, they were kind enough to donate some yardage to Covered in Love a while back. I can't wait to use that fabric with the bright HSTs on it! Happy Thanksgiving to my American readers! 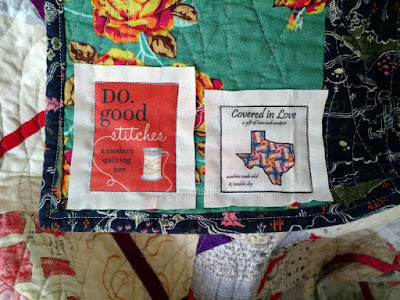 I've been busy sewing, trying to knock things off my "to-do" list. 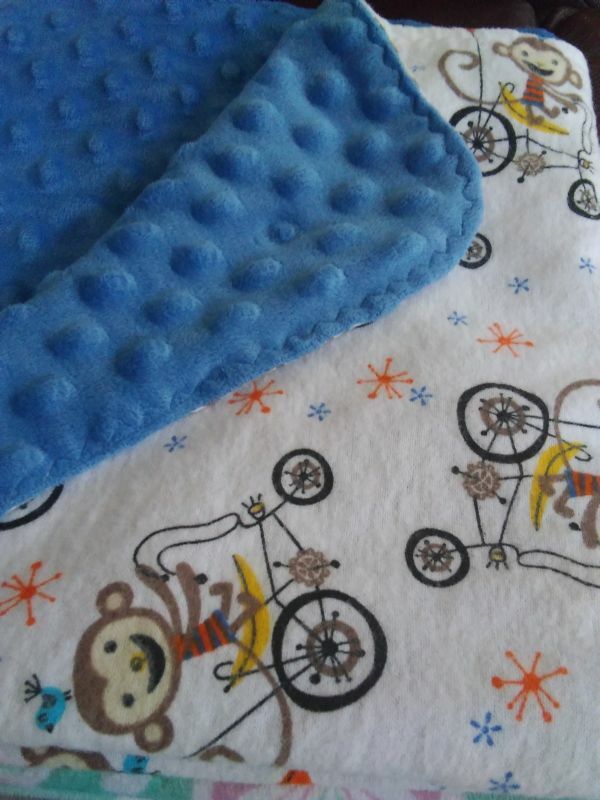 Restocking my stash of baby lovies for gifting has been on there for a while. 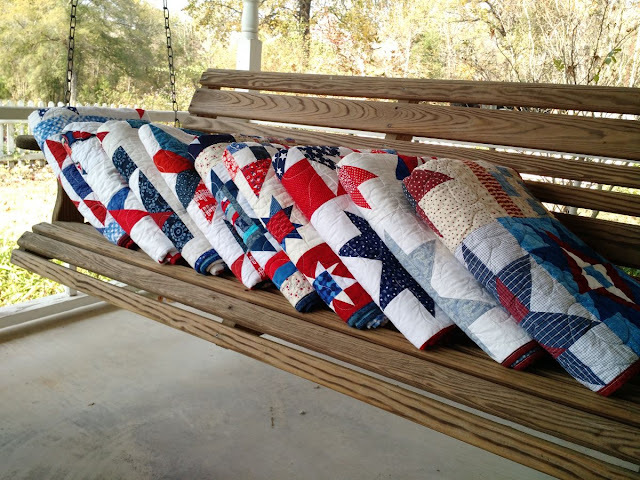 I always keep an eye out for flannel and minky-type fabrics in remnant bins to make these from. 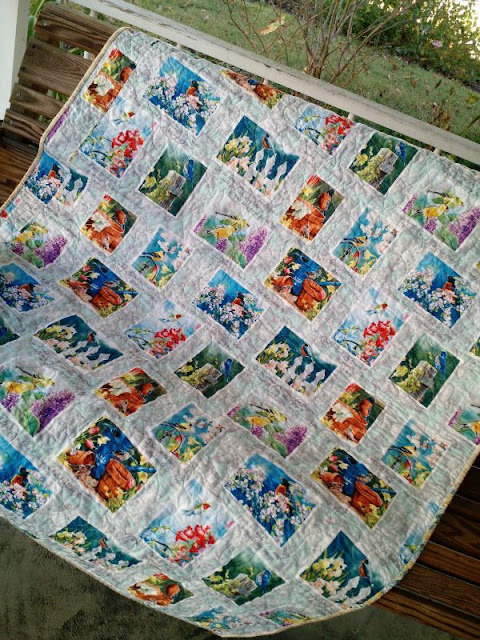 I sew them together pillowcase style, turn right side out, and stitch over the edge. Some of them are big enough to use as blankets, but most are smaller. They're really meant to be used more as security blankets or "lovies" for a toddler. 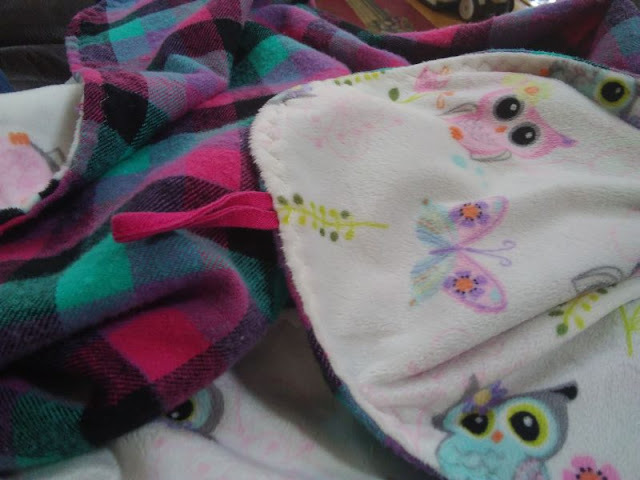 I put a loop on each one so it can be clipped to a stroller or diaper bag. 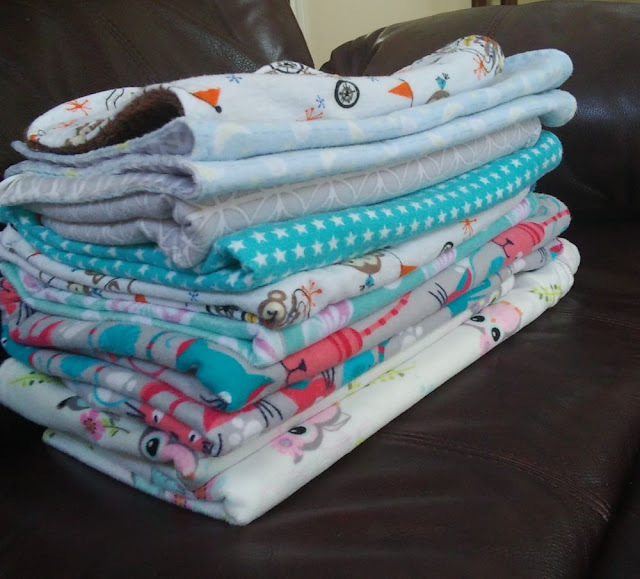 I've got 11 freshly washed and very cuddly lovies ready to go now. 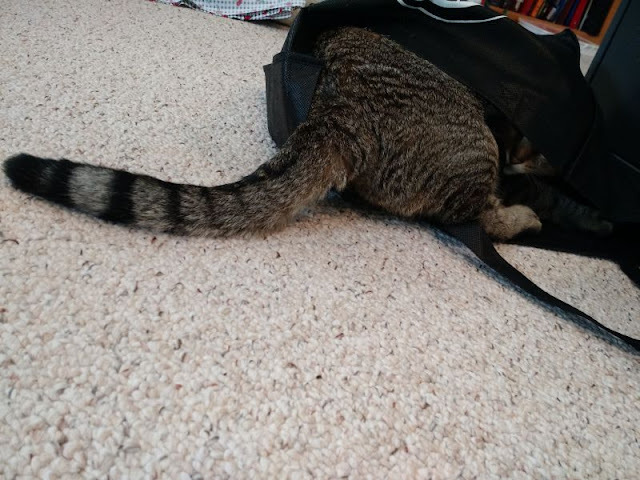 The kitties insisted on quality testing (prior to the wash). A lot of the stitching I've been doing for Covered in Love this week is behind-the-scenes stuff, like cutting and assembling backings for tops. Soon there will be a batch of new finishes. 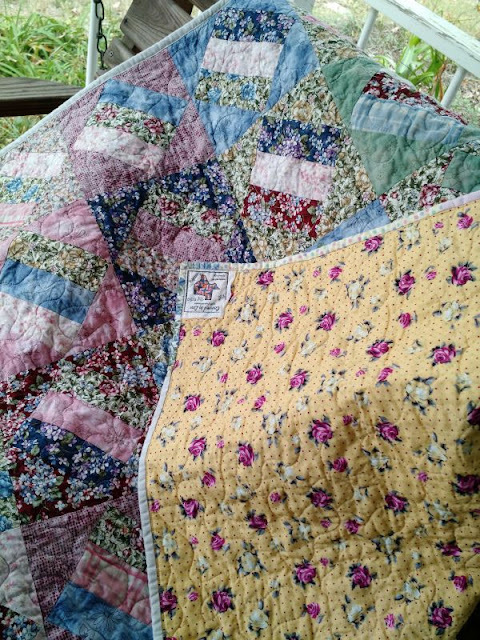 Meanwhile, Beryl sent in two pretty finished quilts! I love them both! Happy Thanksgiving, everyone. I hope you're warm, well-fed, and surrounded by faaily tonight. Happy Thanksgiving everybody (well, all the Americans, that is)! I hope you're looking forward to a holiday surrounded by family and good food. I'm giving thanks for all the supporters of Covered in Love, like my do. 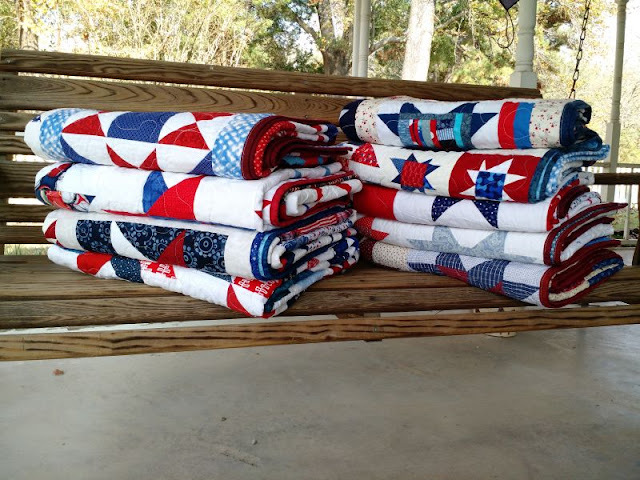 Good Stitches Circle who recently sent in these beautiful quilts! 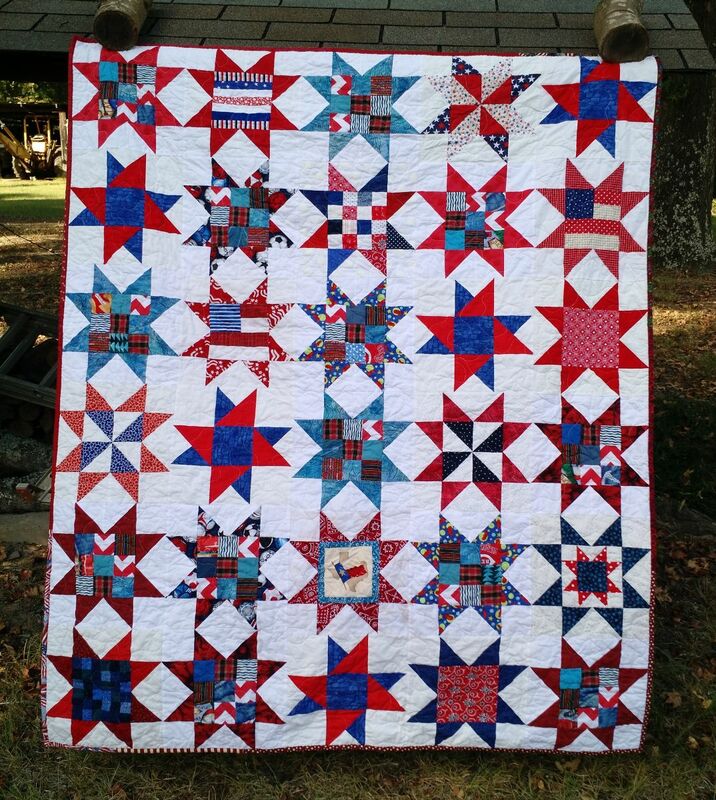 The last three quilts from the July block drive are finished and it's time to wrap this one up! 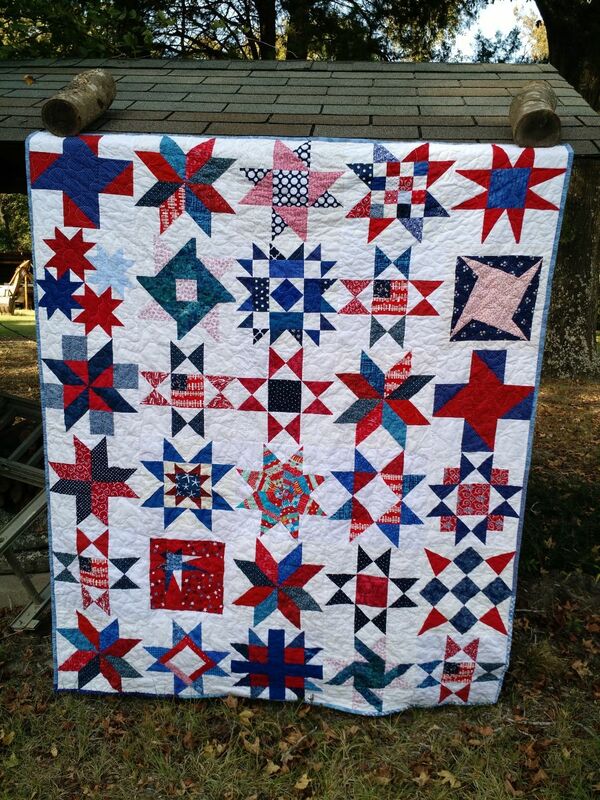 We made 9 beautiful red, white, and blue star quilts to be gifted to grieving families through Covered in Love. 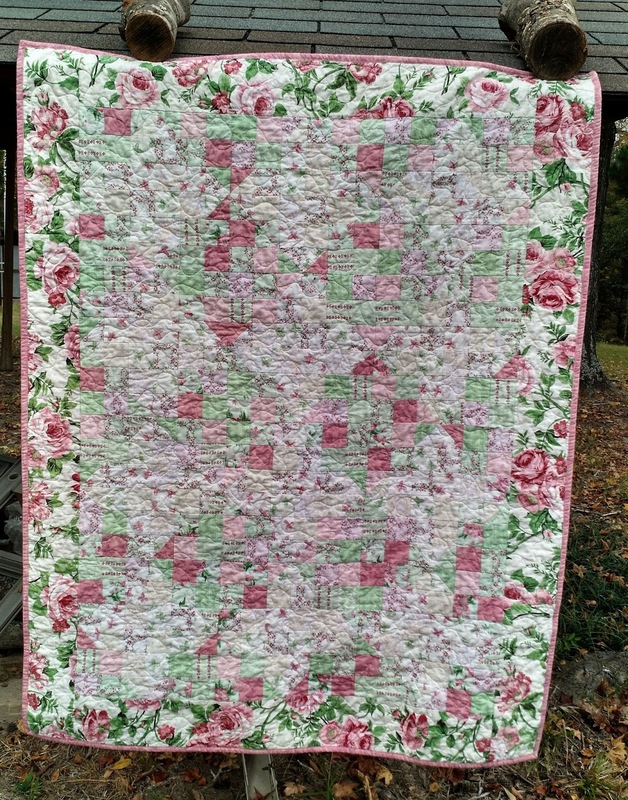 Here are the glamour shots of the last three quilts. 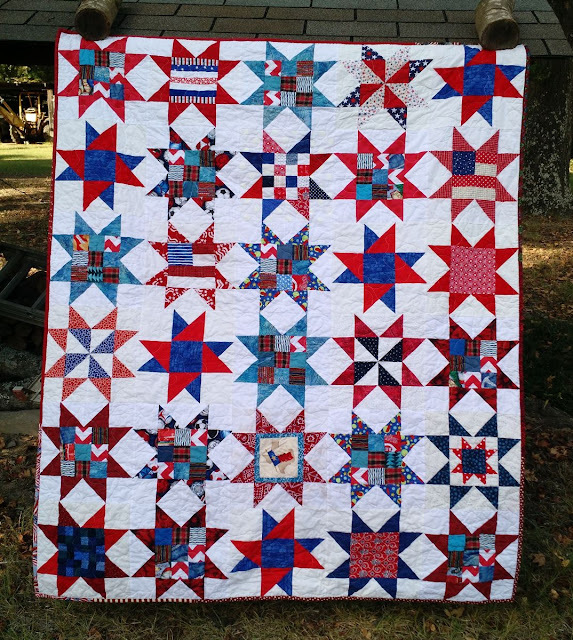 If you contributed blocks and don't see them in one of these check out the previous posts with the first six quilts here and here. 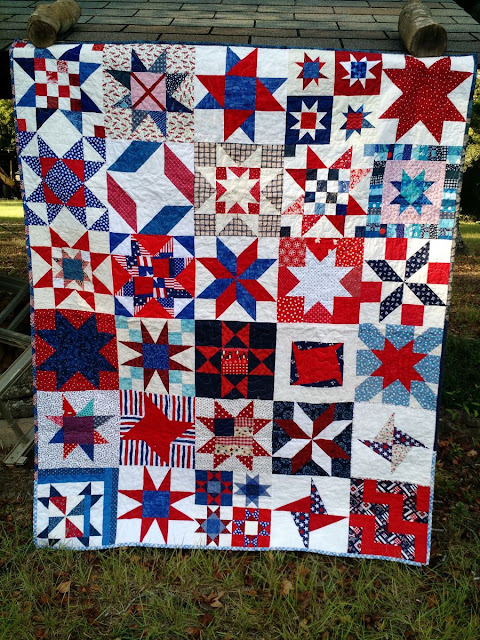 This block drive was a repeat of one from last year where we made five patriotic quilts. The chaplains have told me how much families loved those quilts, so I can't wait to hear how these are received. These were taken up to the hospital today along with some others to make a total of 260 quilts donated! 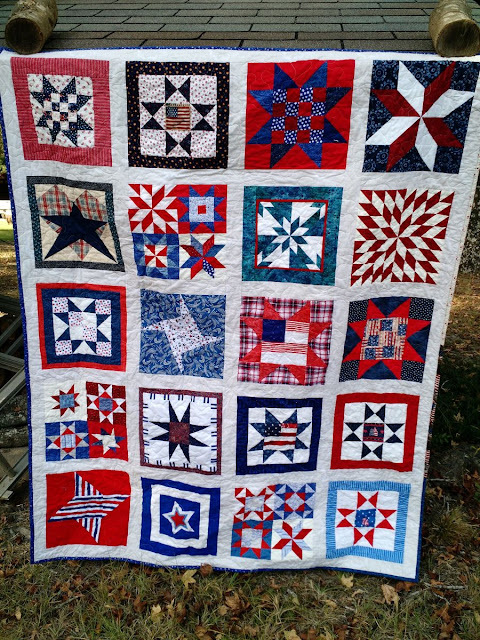 Five of these star quilts were quilted by a wonderful local quilter, Kathy. I officially couldn't have done it without her-- or any of you! 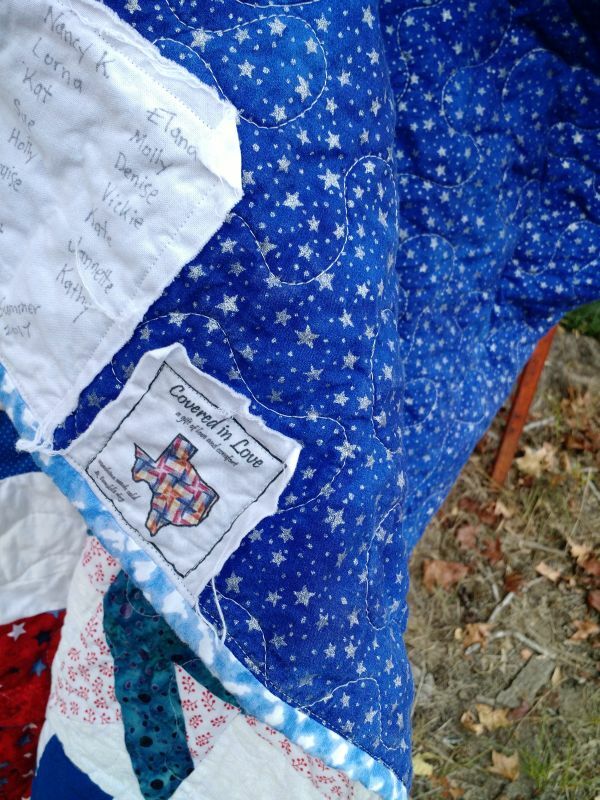 Take a look at the map below of all the quilters who contributed. I had a fun time taking quilt-y glamour shots of all nine quilts together the other day before they went up to the hospital. 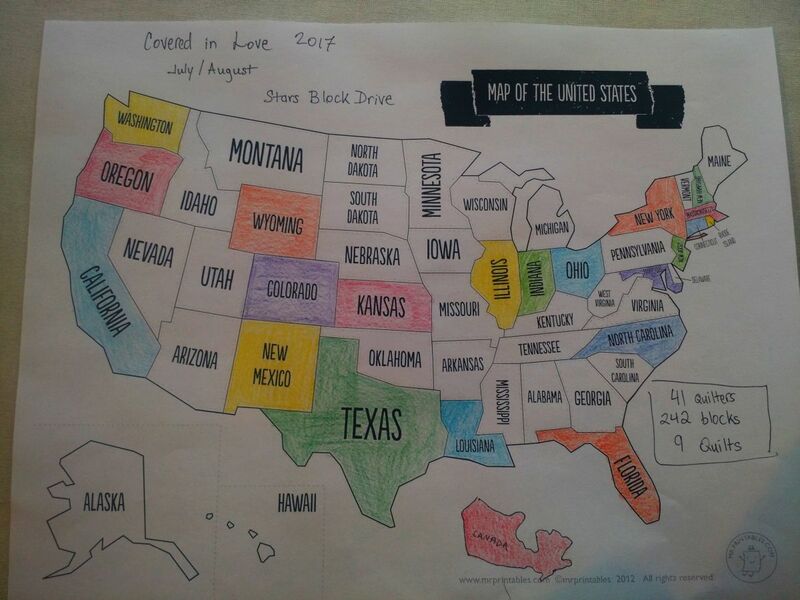 Thanks to everyone who had helped Covered in Love to grow! October was my month to be the Queen Bee in my do. Good Stitches circle and the blocks have been trickling in. 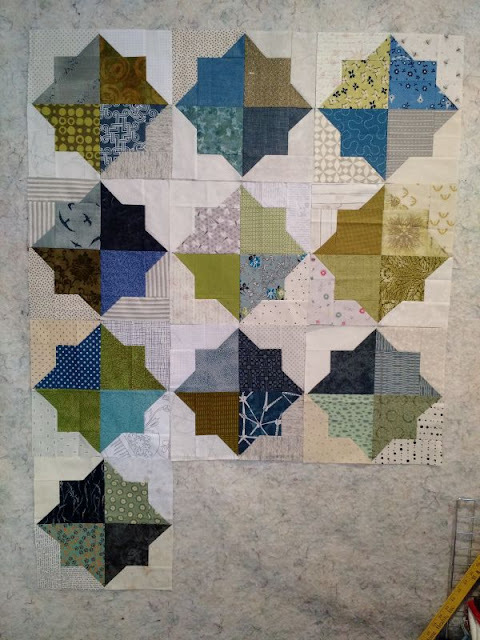 We're doing the Double Square Star block from Missouri quilt company in blues, greens, and greys. That's what's on my design wall this week for charity, what about you? 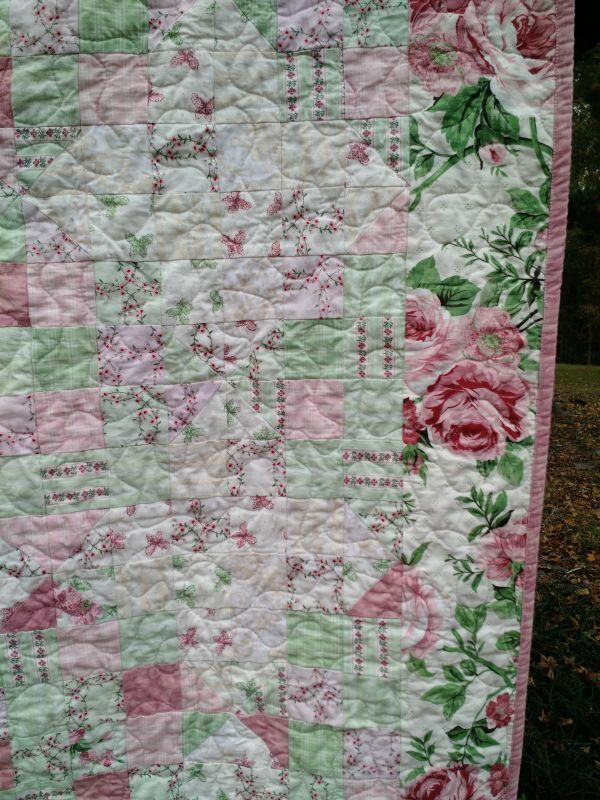 I have some more pretty quilts of Theresa's to show this week. She gave me two matching rail fence tops that are so pretty and soft and floral! The only real difference between the two is the backings. 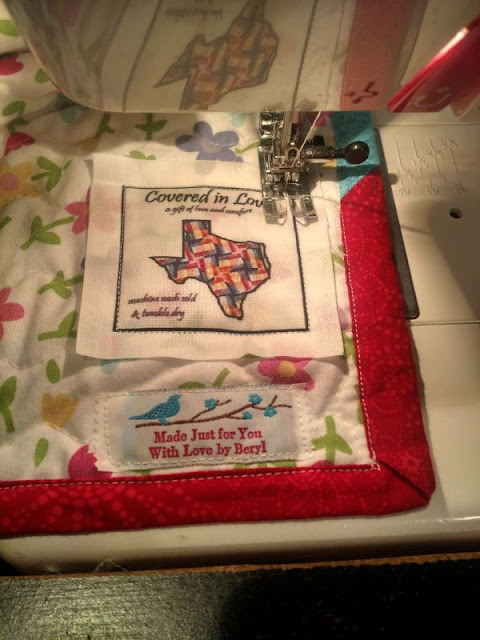 Sandra has sent in some great cuts of fabric for backing and among them was this beautiful bird print with inspirational quotes. 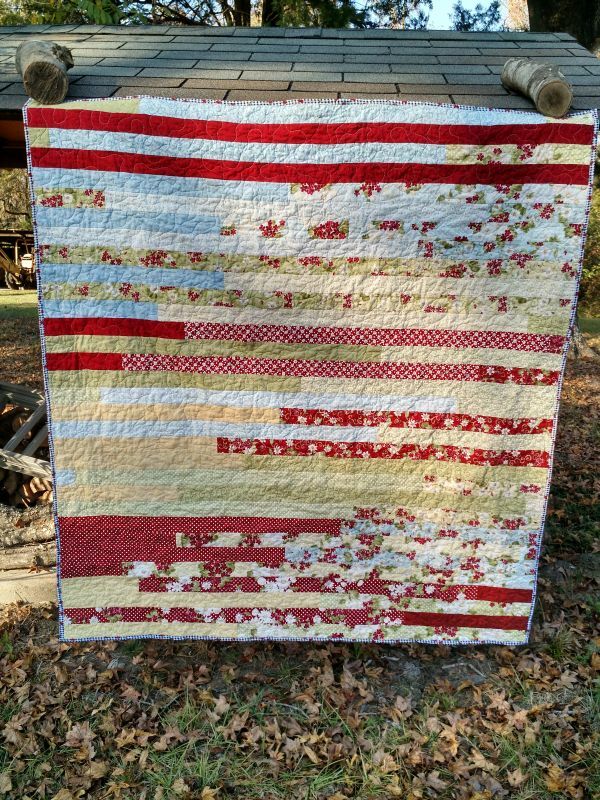 For the other quilt I found a pretty yellow print. 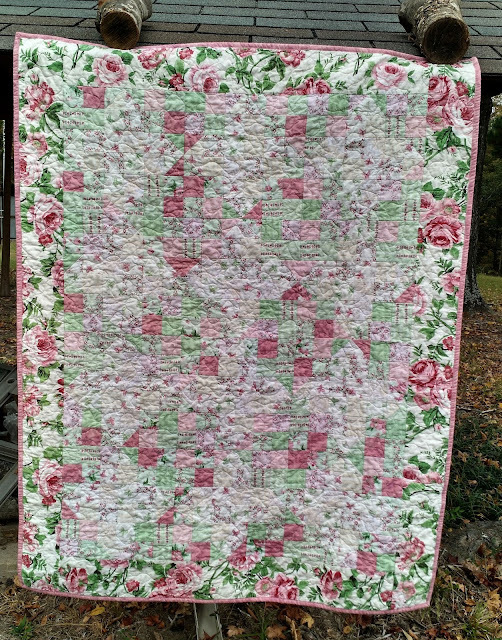 The third quilt is so softly colored it's hard to make out the design in the photos. 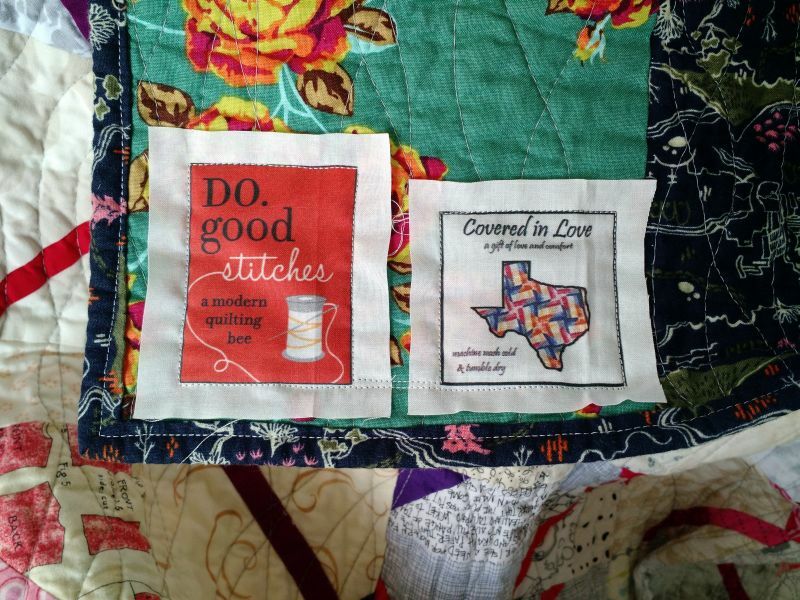 It's actually a split 9 patch with diamonds on point made from the darker value fabrics. 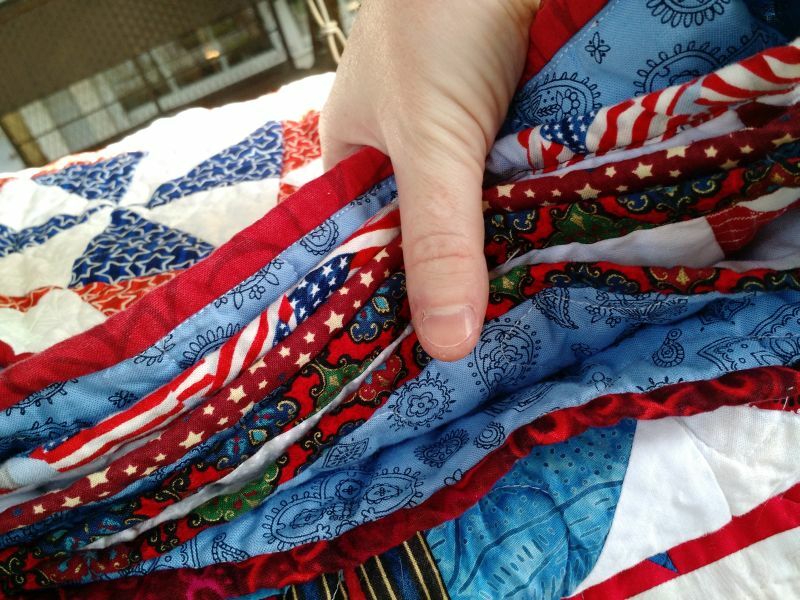 Theresa even included bindings to match many of her quilts. In the closeups you can see all the pretty, small squares. So far 4 of Theresa's tops have been quilted with many more to come. I can't wait! 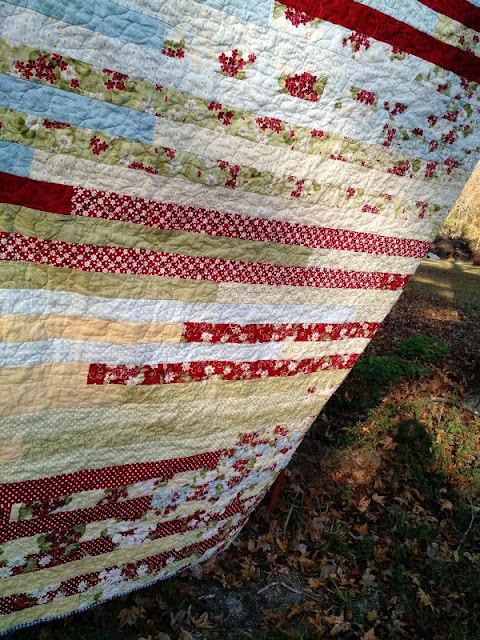 Can you believe it's November already?! The new block drive is up and I have more finishes from the July drive to share with you. 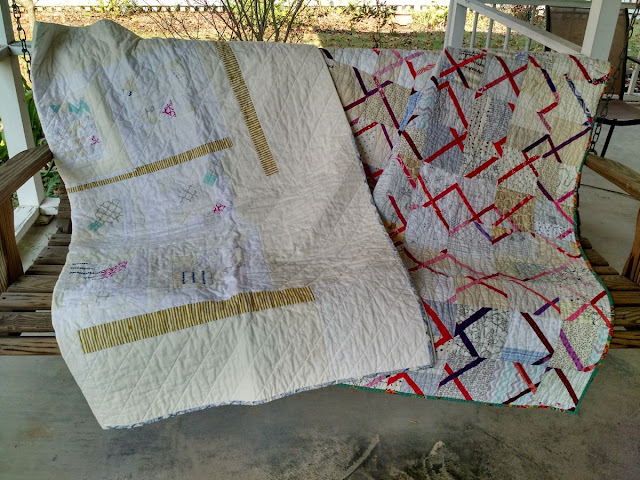 Quilts 1-3 are here and this is post features 4-6 of what will be 9 quilts. I tried to loosely group the stars again for these. The one at the top of the page is made of stars with colored backgrounds or frames sashed with an antique white. 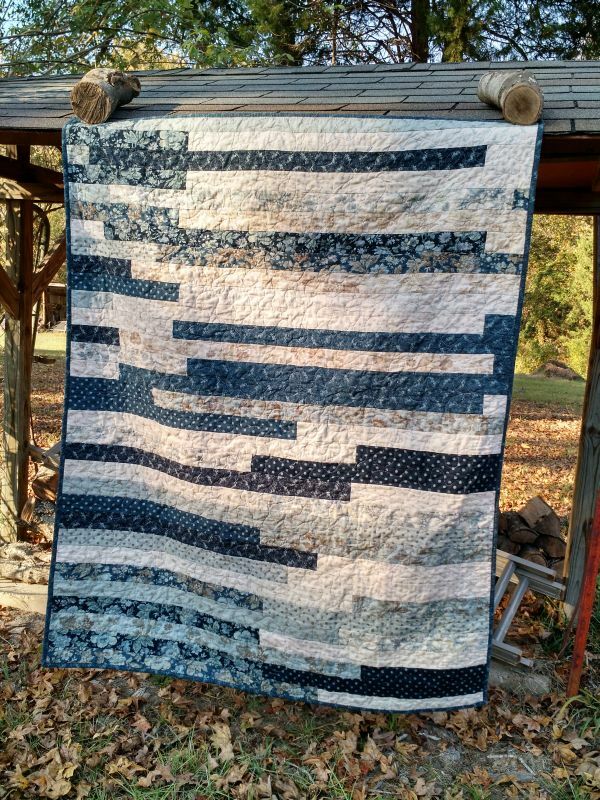 It's one of my favorites, for sure. 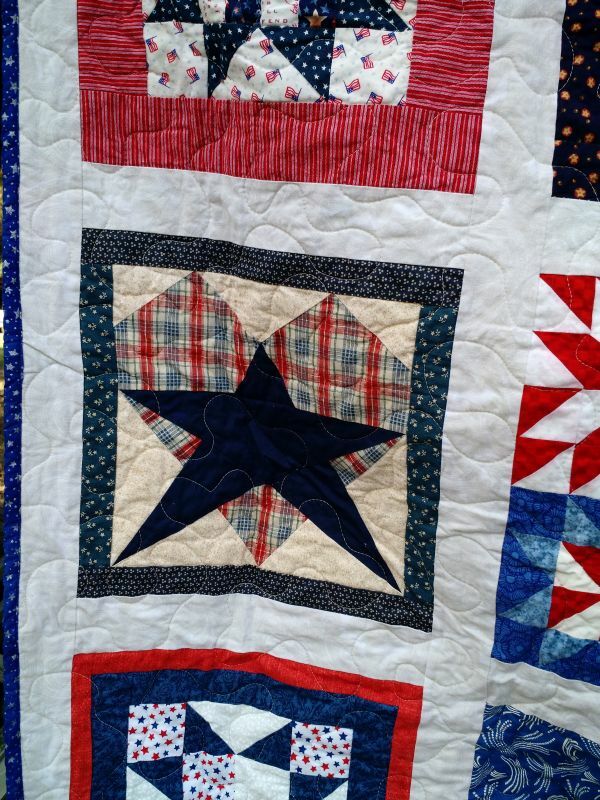 The one above is large stars on white backgrounds, and the one below is (mostly) stars based on a 3.5" block unit. 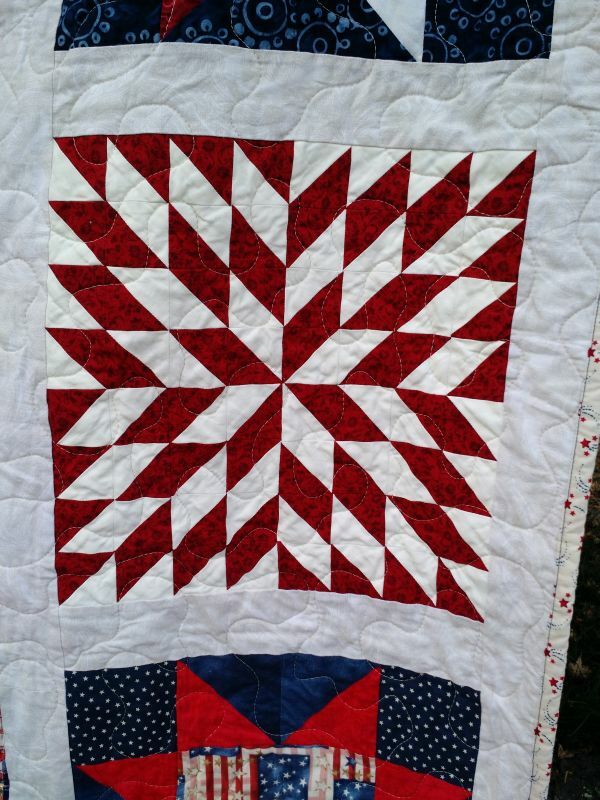 ...to this incredibly complicated block made of meticulously pieced HSTs. 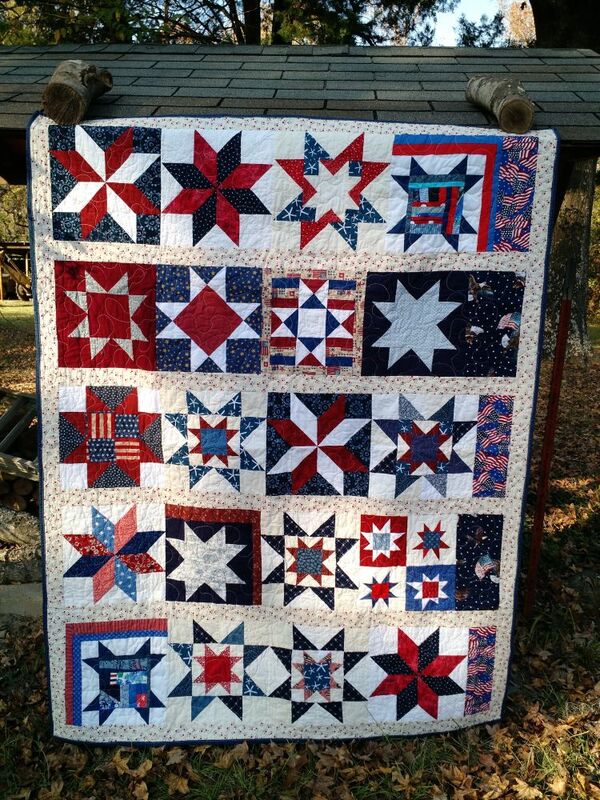 A few of you sent in some bonus cuts of patriotic fabrics I was able to use for bindings and fillers. 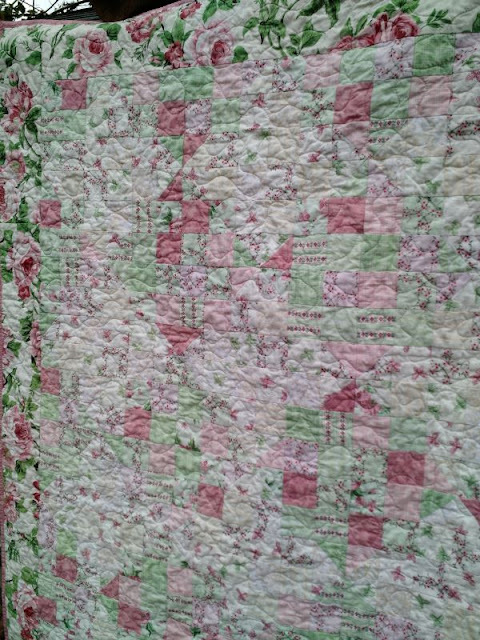 I noticed the pretty, scrappy mix of bindings on this quilts and had to take a photo of it. 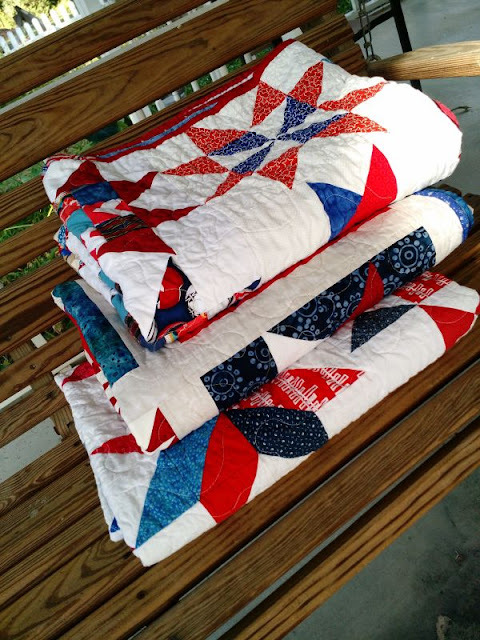 One of these quilts was bound in reds and the other two were done with blues. 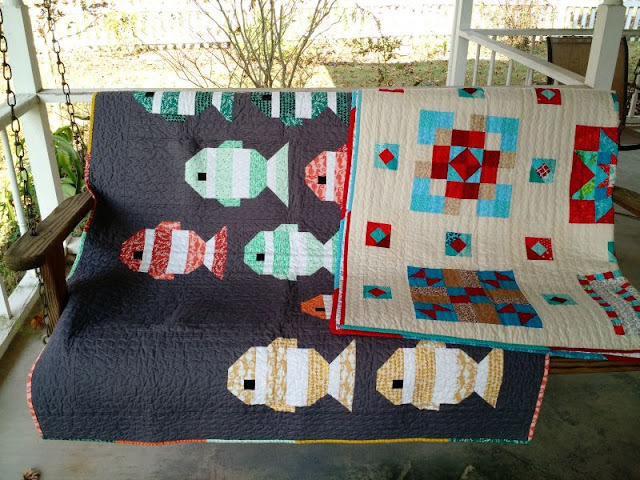 The last three of quilts from July's block drive are in various stages of being nearly done, so soon I'll be able to take a picture of all nine together! 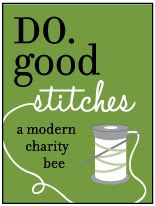 Meanwhile, you can check out the first three here. Christy sent in this blue yardage with glittery silver stars, perfect for backing. Thank you to everyone who contributed to July's drive. Over 40 of you! 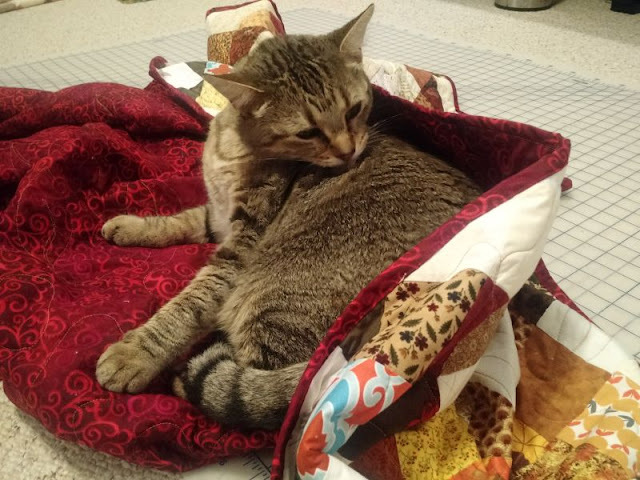 The Nov/Dec block drive is now live if you want to continue - or get involved for the first time - helping CiL make quilts!